When you book any flights in any destination, TraveliGo will give you a special privilege. 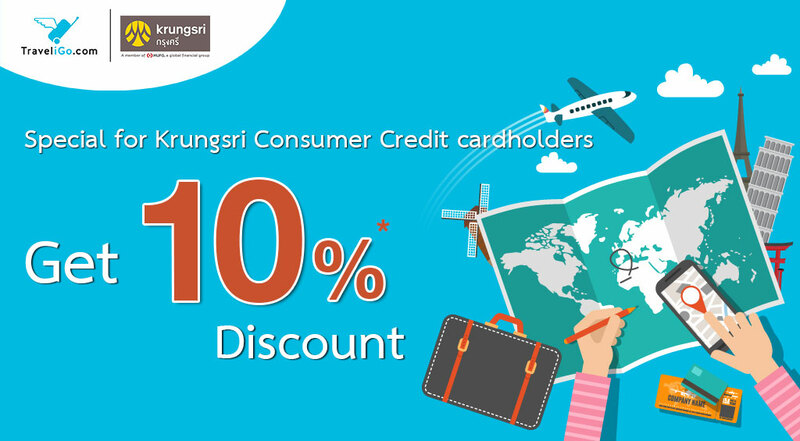 Become more special when you book any flights around the world with Krungsri Consumer Credit Cards. When you book any hotels in any destination, traveligo.com will give you a special privilege. Just fill in your information to get a discount code and use the discount code before payment. That’s it, you will get 10% discount. Get 10% discount for Krungsri Consumer Credit Cardholders when make a flight booking in destinations worldwide on www.traveligo.com/krungsri/flights and pay via your Krungsri Credit Card through website in Thai Baht (THB) currency Only. Booking period Today – 31 May 2019. The discounts will appear in the final stages of the reservation after putting the correct discounts code (Promotion Code). Please make a booking in advance depending on seat availability and our terms and conditions. Krungsri and TraveliGo reserve the right to change conditions without notice. This promotion cannot be transferred or given to other collectors, change / exchange / refund. This promotion cannot be combined with other discounts or use with product pricing fixed. All flight booking depending on our terms and conditions. Krungsri is not be responsible, not be held liable for any part in any of the services provided by TraveliGo so if you have any questions or problems, please contact to TraveliGo directly at +66 (0)2-1871008. Krungsri reserves the right to change terms and conditions or cancel this promotion without notice. In case of dispute, the decision of the Krungsri is final considered. Qualified booking(s): Any discount is valid only for the price which display for the flight(s) belong to TraveliGo.com by booking on www.traveligo.com/krungsri/flights. This discount code can be used by Krungsri Consumer Credit Cardholders only. The value of the discount code: Discount 10% with maximum up to 300 Baht.